China’s increasingly large appetite for smartphones is well-known. 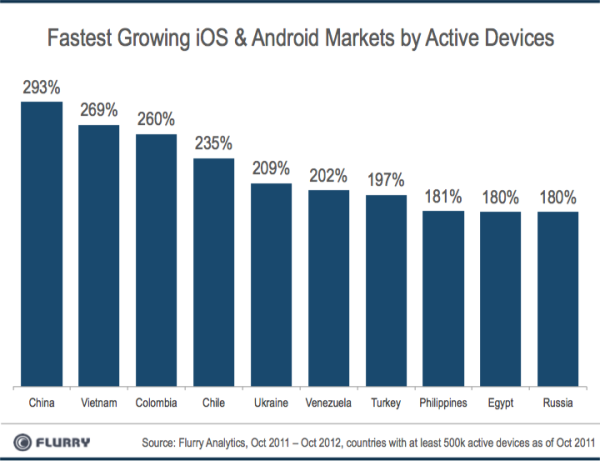 Since early 2012 it has been the leading source of new iOS(s AAPL) and Android(s GOOG) device activations in the world. 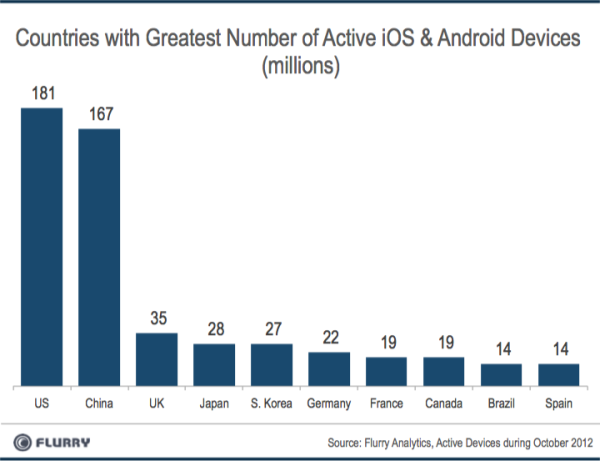 But while the U.S. has long had the greater number of those devices in use, it’s about to be overtaken by China, according to a report from Flurry Mobile published Wednesday. When it happens, that will make the U.S. the second-most important mobile market in the world. Flurry, which gets its data from more than 250,000 apps on 750 million devices worldwide, said the milestone may happen as early as the end of the first fiscal quarter of 2013. The only thing preventing that from happening sooner is the upcoming holiday gift-giving frenzy of iPhones, iPad minis, Nexus 7 and Kindle Fires “that will spike the U.S. installed base.” Meanwhile, China still doesn’t have the iPhone 5 or new iPad mini yet, but some carriers will start carrying the new iPhone before the year is out, according to Apple CEO Tim Cook. When they do, that will provide a boost to China’s numbers. It’s been clear for a while that China would become the largest source of active users and many iOS and Android developers, content publishers, device makers and investors have been anticipating the change. Apple, for instance, has been opening as many Apple retail stores in China as it can, started accepting Chinese yuan for App Store purchases, and has been getting its new devices to market there faster each year. Still, the company’s phones and tablets remain far behind the sales of Android devices in the country, from Samsung, ZTE, Lenovo and Huawei. China also remains the fastest-growing market for iOS and Android smartphones and tablets: it has seen device activations rise 293 percent in the last year. But according to the new data Flurry collected from countries with at least 500,000 iOS and Android devices activated, close on its heels are Vietnam and Columbia. Both are also seeing rapid adoption of these devices, boasting 263 percent and 260 percent growth in the last year. Since the last time this information was counted, near the end of August, Vietnam has leapfrogged much larger countries like Chile, Brazil and Argentina. With its surging growth, Columbia makes its first appearance on the list. You need to remember that the market is not only Android and iOS and this is install base not current sales so that chart is very misleading about the size of the markets.